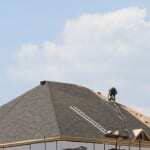 At Slippery Slope Roofing, we have experience in all manner of roofing emergencies. Whether you’re dealing with major structural damage or with a more minor problem, dealing with a problem with your roof can be stressful, and the search for quality roofing services can be frustrating. Roof damage can greatly disrupt your life, and it’s easy to become overwhelmed by the process of finding a solution. To help you navigate this process, our team at Slippery Slope Roofing has put together this outline of what to do if you need roof repair. Assess the immediate damage. The first thing to do when your roof is damaged is to assess the current state of your roof. Has any debris breached into your home? Are there any leaks or visible holes? Getting a sense of the extent, nature, and location of the damage will help you communicate with our roofers, who will be better able to assess what roof repairs might be necessary. This first step is also the time to figure out if your home is still livable while the damage remains. Cover or patch what you can. While you’re looking for the best roofing services, you still need to protect your home. Cover any leaks with tarps to prevent water damage. If you can locate the leaks, you also have the option to patch them with tar. For larger holes, you can also create a temporary seal with roof flashing. If you would rather leave all roof repair and patch efforts, you can call us at Slippery Slope Roofing to get our team on it as soon as possible. Call a roofer. Damaged roofs are one area of home repair that is really better left to the professionals. Not only do our team members have the right experience to stay safe working at that height, we know how to install every part of a roof correctly and efficiently. If you need roof repairs, call our team at Slippery Slope Roofing to get us on the job right the way.